•To improve digestion in any bird under any condition. •Uses can also include, birds with chronic pancreatitis, malabsorption syndrome, proventricular dilation, neonates with slow-emptying of the digestive system, geriatric birds, or birds under stress of illness. •May be beneficial in Day 1-7 neonates being hand-fed. •Also indicated in chronically ill or geriatric birds that seem to not be getting all the benefits from their food and for sick birds under stress of illness. •For hand-feeding when formula seems too thick when the correct amounts of water and powder are used. 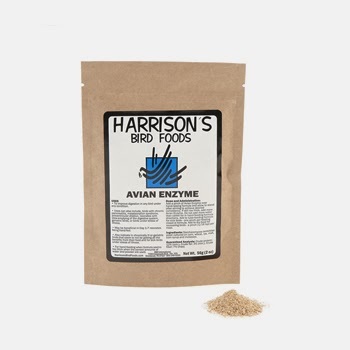 Add a pinch of Avian Enzyme over hand-raising formula and allow to stand after stirring to achieve desired consistency. If still too thick, add more Avian Enzyme. Do not add more water than called for in hand-feeding formula directions. Add to tube-feeding formula for sick birds – one pinch per feeding mixed in formula. Add to dry food for recovering birds – a pinch (1/16 tsp) per meal.